A KPI (Key Performance Indicator) is a metric tied to a target. It demonstrates how effectively a business is doing at achieving its objectives. Good KPIs act as a compass guiding an organization on the right path to success. 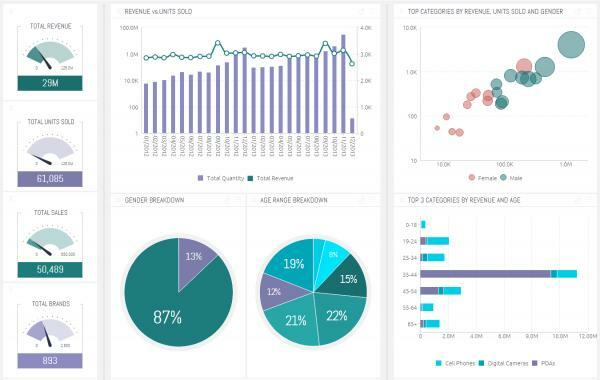 KPI dashboard templates simplify complex data sets through data visualization to provide at a glance awareness of current performance to help make better business decisions. Which ones should you consider? 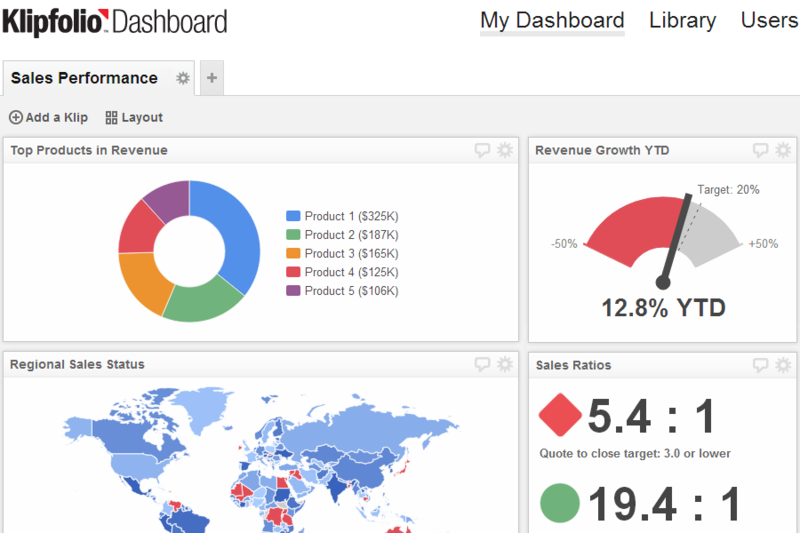 Here are the 10 best KPI dashboard templates to keep your business strategy on track. Domo Combines a powerful backend that sits on top of and connects into any existing system where data lives, including those for customer relationship management, enterprise resource planning, human resources and financials, as well as any data repository or current reporting system. 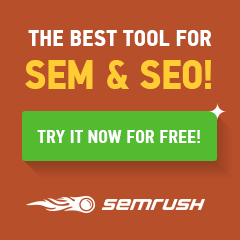 is a great self-service business intelligence (BI) tool that offers a wide data set, connector support and delivers a unique set of social collaboration tools as well. Domo seems to be best suited for situations in which a team is sharing a dashboard on key metrics. 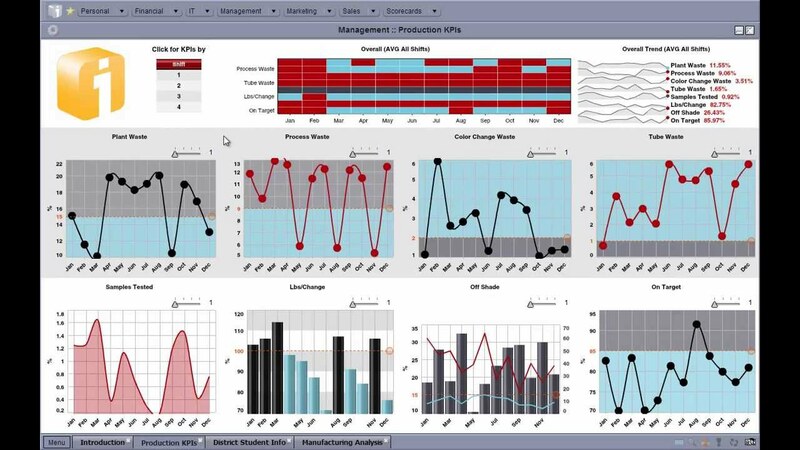 Dundas BI is a next-generation business intelligence platform that was released in 2014. It combines both business intelligence and analytics tools into one platform that can be accessed as a standalone or easily embedded into other applications. The flexible and scalable solution has a strong focus on self-service, meaning any user can analyze data and create dashboards regardless of job role or technical BI skill. It has drag and drop abilities and can also be fully customized. iDashboards address the needs of organizations worldwide seeking an intuitive, collaborative way to view and analyze their critical business information. Because it’s so simple to learn and navigate, iDashboards cuts back on the extensive training time typically associated with complex Business Intelligence solutions. iDashboards is a great fit for financial services, government, healthcare, manufacturing, and retail, but can be applied to many other industry verticals. 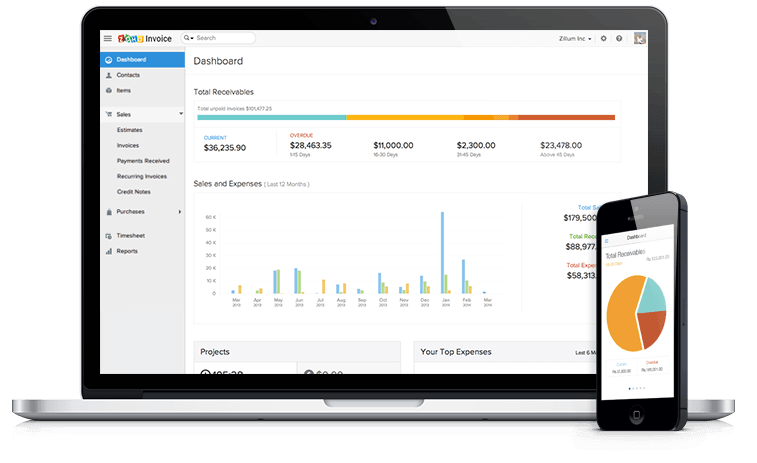 Klipfolio is a fully cloud dashboard application that enables real-time visibility into the data and KPIs behind your business, so that you can improve performance, relentlessly. Connect to hundreds of data sources online and offline, including: (a) web applications like Twitter, Moz and Google Analytics. Dashboards built in Klipfolio can be easily shared and viewed on browsers, wall-mounted TVs and mobile devices (iOS and Android). Klipfolio dashboard software is used by a wide variety of businesses, big and small, and by professionals working in a variety of roles, from marketing and sales to BI, consulting and executive management. 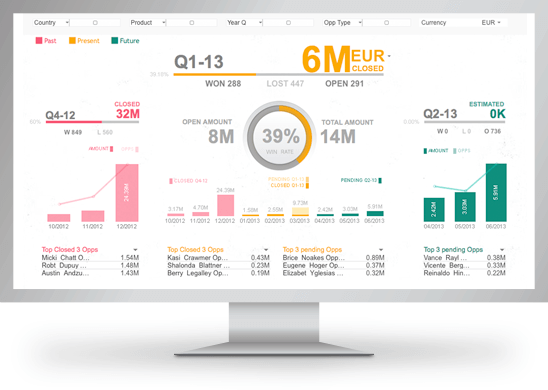 Qlik’s unique selling points are that it ranks highest in customer loyalty, provides satisfactory performance, offers a wide variety of features, and is known for its product quality and overall market position. 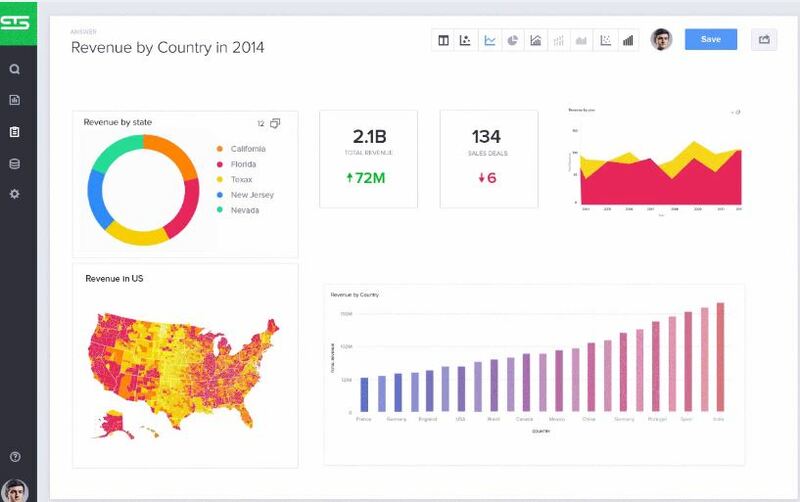 Qlik is probably of the few visualization tools that offers an integrated BI platform and comes bundled with adequate demos, training manuals, and tutorials that can easily fascinate clients and new customers, giving them insight in a fraction of the time they expect. Sisense is an end-to-end business intelligence (BI) solution that was developed to be accessible for any type of user, even those with little or no prior experience with BI software. Their full suite of applications provide users with the tools they need to manage and support business data with analytics, visuals and reporting. This out-of-the-box system doesn’t require lengthy implementation or training, so businesses can have it up and running quickly. Sisense was chosen as one of the Top 10 BI Vendors of 2013 by CIO Magazine and “Best in Show” at the O’Reilly Big Data Strata conference. 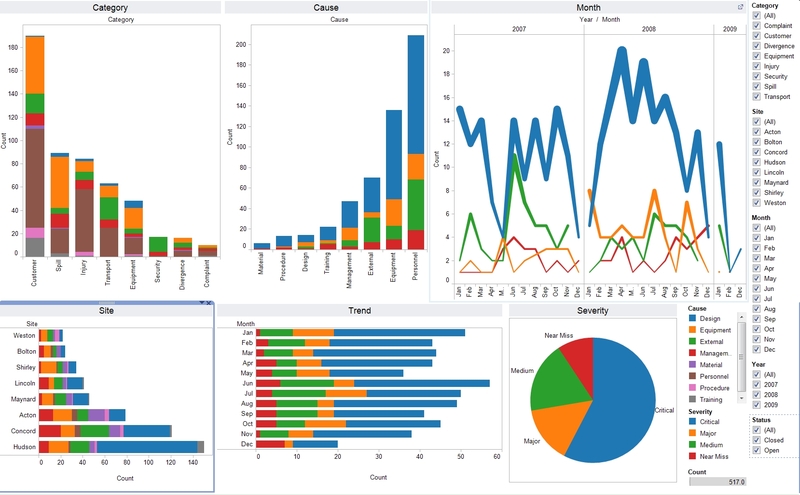 Tableau is tailored to meet the needs of anyone looking to explore and analyze key business data, regardless of technical or analytical background. Tableau has taken years of research and built best practices right into the solution. 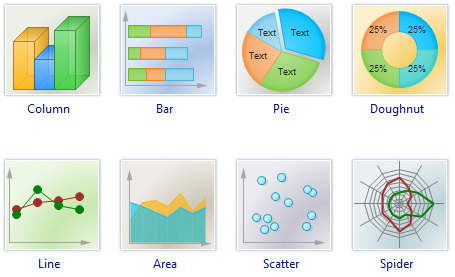 Tableau has become an industry standard with the a bility to connect many data sources and create impressive looking visualizations easily. The interface feels much more modern than some of its competitors. ThoughtSpot has a user interface driven by a search bar, much as a user of Google experiences, and natural language queries can be entered using the language of the business concerned. Combining a search oriented approach with BI is really quite innovative, especially as the dominant paradigm right now is a drag and drop graphical interface. ThoughtSpot is growing quite quickly, and saw 800% growth last financial year – so the approach is clearly attractive to business users. ThoughtSpot has also made it into Gartner’s Magic Quadrant. 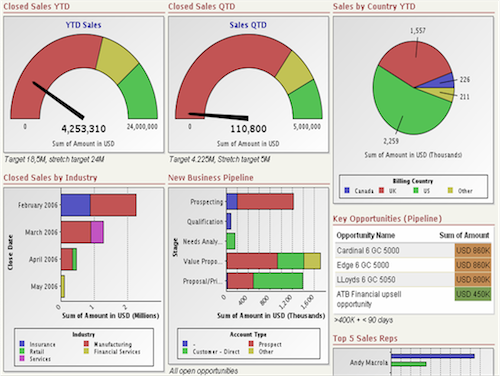 Do these KPI dashboard template give you a good idea of what’s available? Would you add any others? 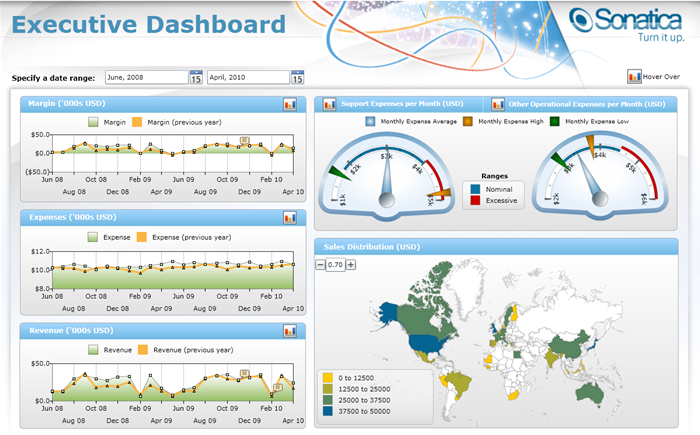 Does your organization need guidance with KPIs and KPI dashboards? Key Performance Indicators (KPI) are measurable values that demonstrate how effectively a company is achieving key business objectives. 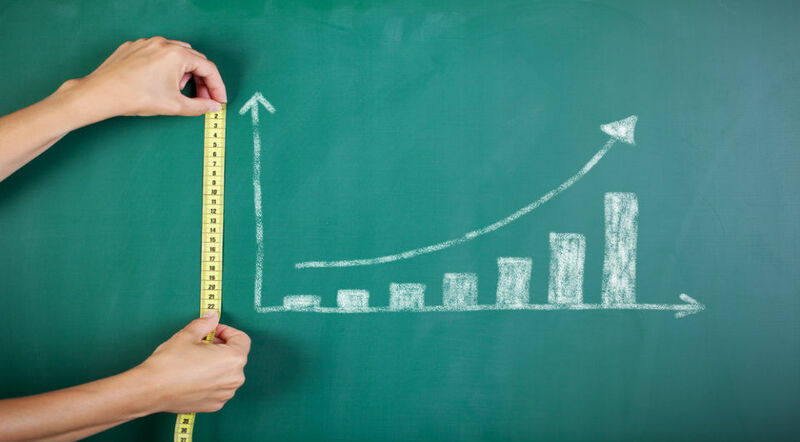 Organizations use KPIs to evaluate their success at reaching targeted goals. 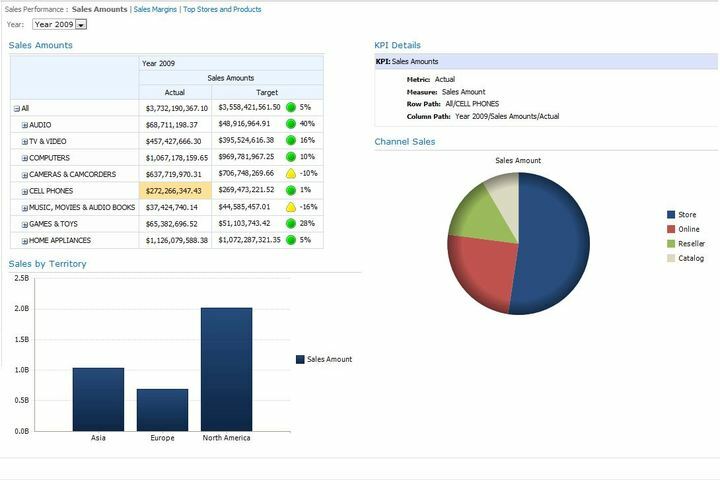 KPI dashboards are actionable scorecards to keep the business strategy on track. What are examples? 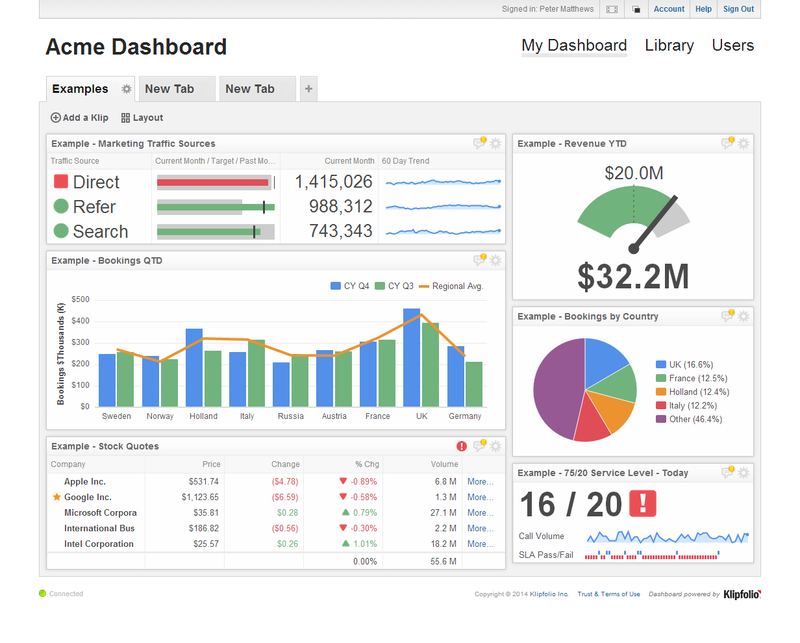 Here are 7 KPI dashboards that are scorecards to success. Return on Investment is one of the most sought after goals for any company. 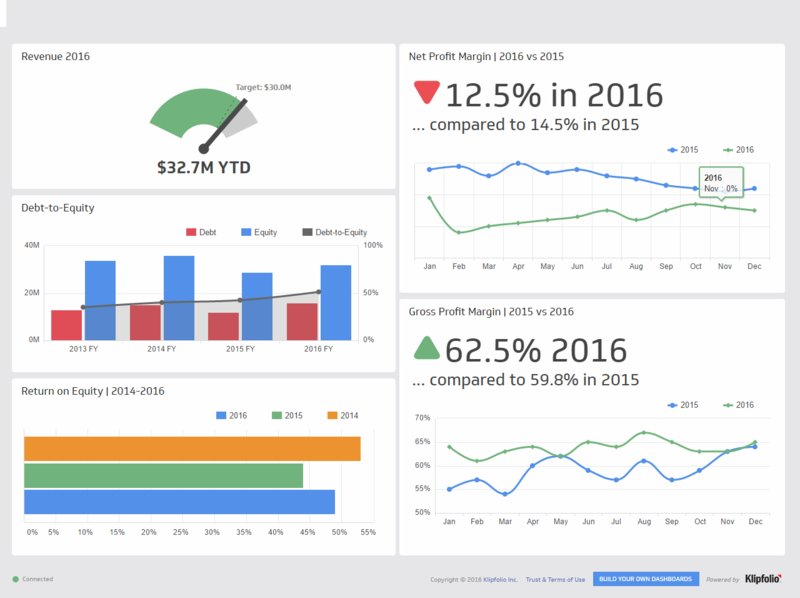 This dashboard from Klipfolio is a great example of marketing accountability to deliver new revenue and new customers through a new marketing campaign. It’s simple, clear and transparent. It gives an up to the minute snapshot of the key metrics that impact this business objective. Sales are one of the objectives that KPI dashboards are often built around. 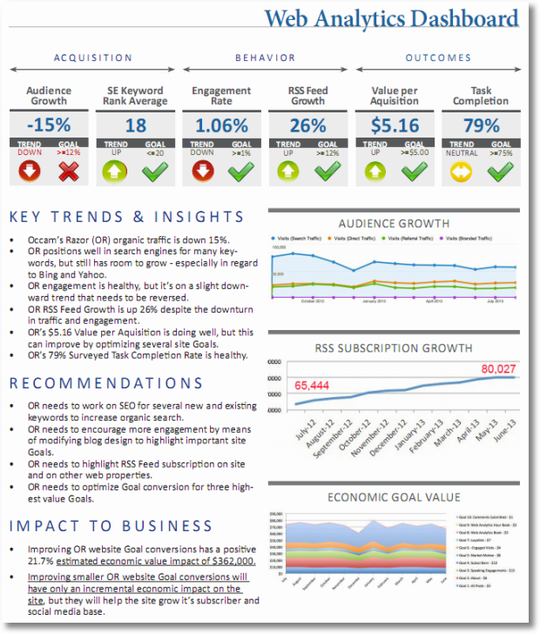 This KPI dashboard from Find Examples does an excellent job of demonstrating the actionable nature of a KPI dashboard. By just looking at it, any sales or management team is able to see if the company is on track to deliver its objective; what tactics and working and who are the most likely opportunities. If the company in this example acts regularly on these results, it’s easy to see how much more likely they are to be successful. 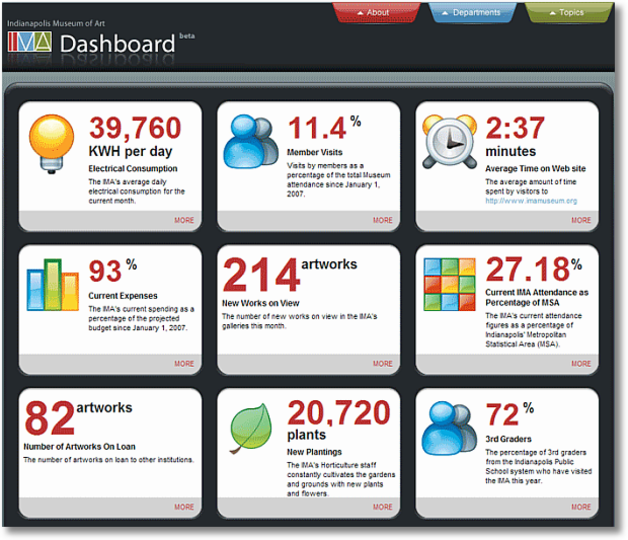 This dashboard is for the Indianapolis Museum of Art from Avinash Kaushik. 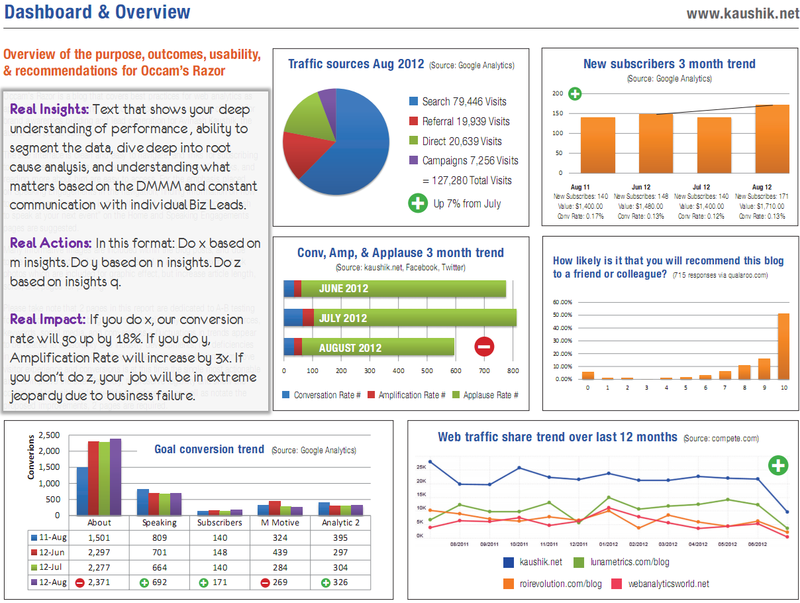 It provides not only a complete snapshot but shows the importance text can provide in a KPI dashboard. In this example, the metrics that are most important to the successful operation and growth of the museum are listed. But there is also the opportunity to provides comments, insights and recommendations through the text box. So the dashboard is a living tool that promotes action. 60% of restaurants fail in the first year according to Cornell University. 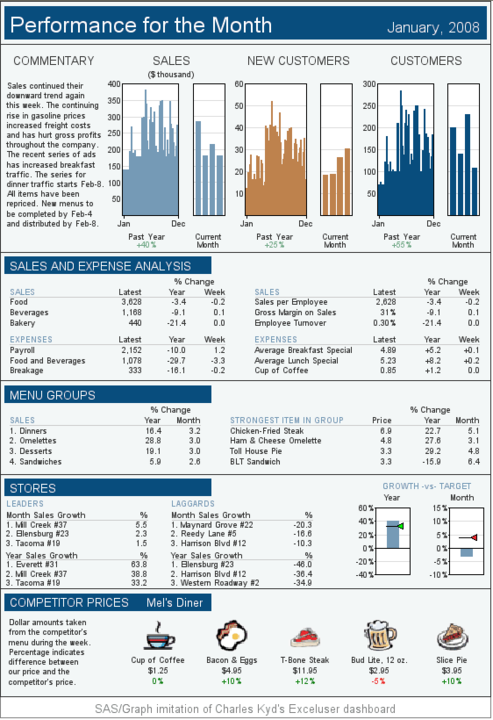 It seems like the hospitality industry would benefit from KPI dashboards like this one that gives a great snapshot of sales, customer acquisition, cost of goods, menus, key stores and competitors’ pricing at a glance. This is a comprehensive look at a highly competitive industry. This dashboard of a website’s performance gives all the vital data, a full analysis with trends, insights and recommendation. It provides great perspective while clearly presenting a point of view for improving performance. A company that has products available globally with different business performances in different parts of the world has specific global goals. Success involves market development, product mix or whether or not customers buy online or offline. 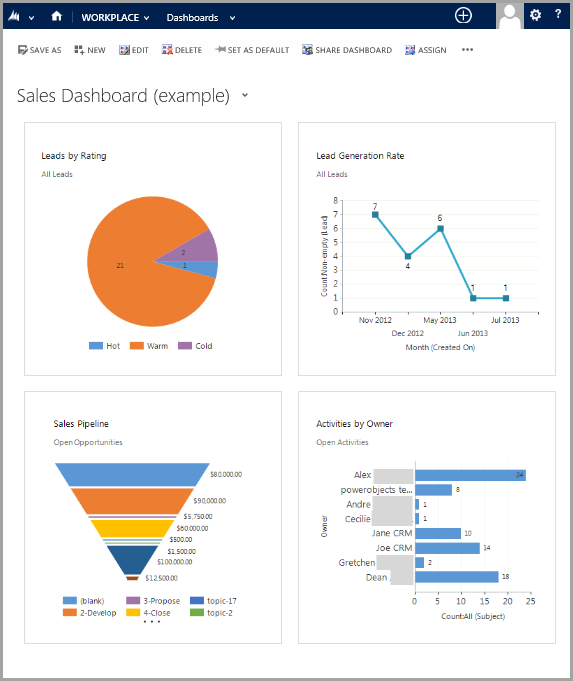 This dashboard from Sharepoint gives executives a perspective and uses traffic lights as icons to highlight products doing well or needing attention. A clear picture of the data doesn’t mean there needs to be a lot of it. But enough to clearly make your point. You also have to tell people what to do with the data. 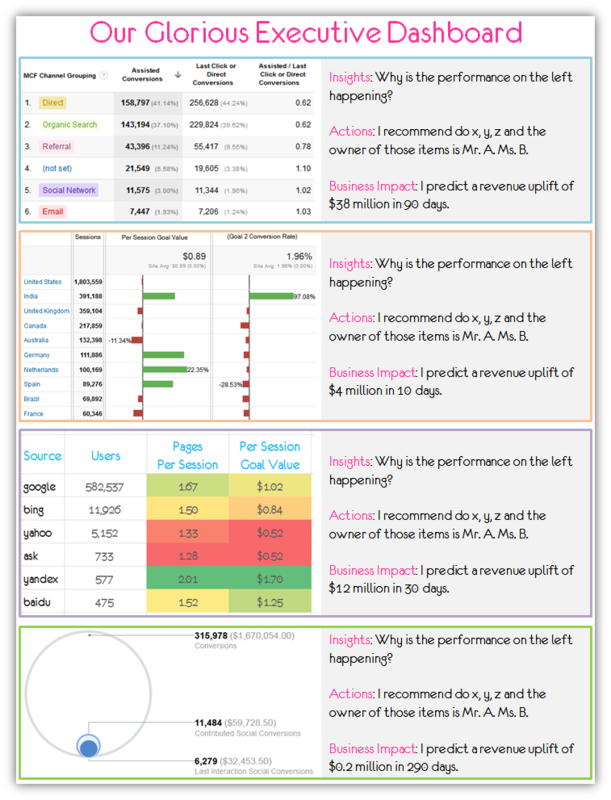 This dashboard for Avinash Kaushik, Digital Marketing Evangelist at Google, is made for C-Suite presentations. It takes the key data findings and, in a text box, presents the insights, actions and financial implications. It’s complete, concise and delivers on one of most important criteria for creating KPIs – taking action. 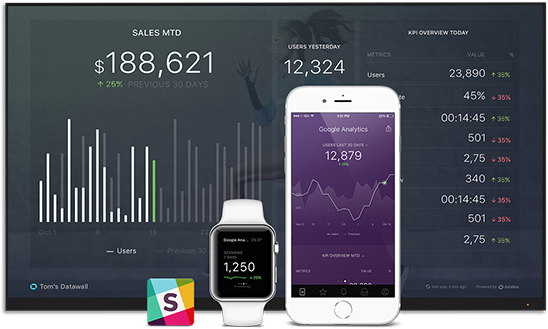 Do these examples help explain the value of KPI dashboards? Do you see one that is relevant to your business? 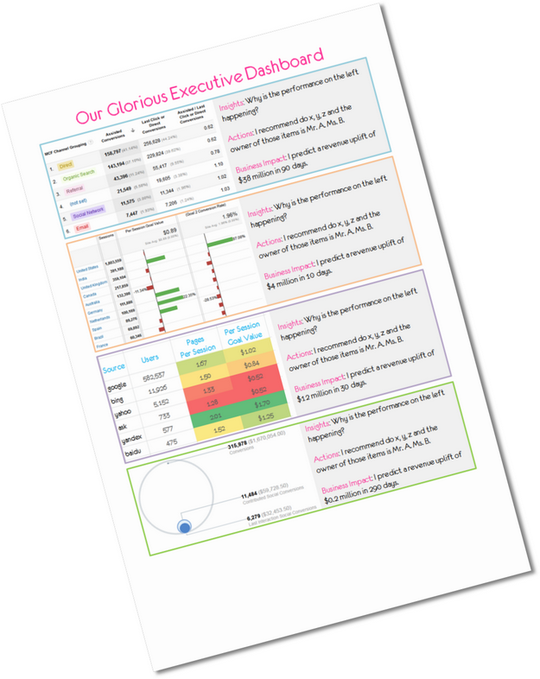 Does your company need help creating KPI dashboards for your business?